Original Publication Date: 1914 for the original collection; between 1910 and '12 for the individual short stories. There are six short stories in this collection, and honestly the first three weren't that interesting to me. Carnacki isn't a particularly compelling character, and the ghost stories weren't creepy at all. Also, when someone goes somewhere to investigate a haunting, and then it turns out to BE a haunting (! ), that doesn't provide a lot of narrative tension or surprise. The stories in Carnacki the Ghost Finder reminded a bit of Hound of the Baskervilles (of which I am not a fan) but with less personality and no logical explanation. What are the rules of these spirits? What makes Carnacki more capable of getting of them than anyone else? I was considering bailing on this collection, but decided to stick with it for one more story. 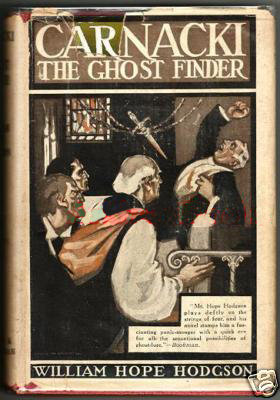 I'm glad I did because the second half of Carnacki the Ghost Finder was much better than the first. My favorite story in the collection was "The Horse of the Invisible," which is a terrible title (all the titles are terrible). There were a lot of elements that made this particular story stand out to me: for one, the haunting itself was really interesting. It's tied to a family curse where every first-born female of the Higgins family is haunted and eventually killed by an invisible horse between the time she starts courting and the time she's married. Because there hasn't been a first-born daughter for seven generations, the Higginses consider the story merely a legend; but with their daughter Mary being tormented by "gobbling horse's neighs" in the night (which definitely sounds annoying), they're prepared to take it more seriously and call in Carnacki to help. Another thing I loved about "The Horse of the Invisible" is that this is the first story where Carnacki uses photography to help him solve the mystery. I have this thing about ghost photography; I find it fascinating even when it's clearly a hoax. William Hope Hodgson does a great job of describing the photographs Carnacki takes so that you can imagine exactly how creepy they are. And finally, the solution to this particular mystery isn't entirely supernatural. I approve of this. I also really liked "The Searcher of the End House," because it was all about Carnacki living with his mom. Amazingly enough, it turns out Carnacki's house is haunted! But he didn't figure this out until his mom start bugging him. Detective, investigate thyself. This haunting was super-complicated and the solution was totally random--and also not entirely supernatural. Carnacki the Ghost Finder isn't the greatest short story collection ever, but it has its moments. In the end I felt like it was worth listening to because of the strong finish.